1) 10-Strike Network Monitor Standard (or simply 10-Strike Network Monitor) is a basic edition of the the program. 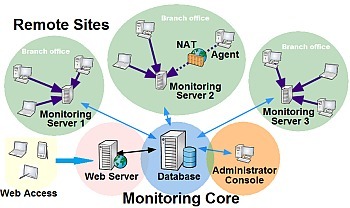 It can monitor simple networks using standard network protocols for executing monitoring checks. 2) 10-Strike Network Monitor Pro is the most advanced version of the program, which stores all the settings and monitoring results in the SQL database, supports the distributed monitoring mode with multiple monitoring servers and remote agents, and contains a built-in web interface for the remote user access. The web UI is fully functional and allows you to manage the system like you do this using the desktop application. It supports the multiple user access with different access rights and roles. The Pro version also offers a visual network map for displaying the actual host state according to the latest monitoring check results. You can easily notice failed hosts colored red. Monitoring Remote Networks and Hosts Behind NAT, routers, etc. If your network is complex and some hosts to be monitored are located in remote networks behind NAT and firewalls (yes, we are talking about the distributed network monitoring), it can be hard to monitor those remote hosts because you need to configure the port forwarding on NAT for accessing it. Using the Standard version becomes awkward if there several hosts using one standard port behind the NAT (for example, for the SNMP service). For such cases, we have released a more advanced version of the program: the Pro version for the distributed network monitoring. You can install multiple monitoring servers on remote networks and they all will work with one common SQL database (Firebird) for reading the monitoring settings and recording the monitoring results.